Lots of snow this winter and it didn’t slow down in January. Charlotte had fun playing in the snow. She liked eating it! There wasn’t a sled so she rode on a shovel while Pa pulled her around the yard. It was too cold outside, so grandpa hung the swing inside the shop. Bo loved swinging. Lacey the English Setter turned 14 this month. Bo really likes watching her and enjoyed playing with her. Charlotte helped Pa fix Grammy’s dishwasher. Lots of sweet photos on your great double page. Very nice cluster work on this. What sweet photos and your grandies are growing so big! I enjoyed your journaling and looking through this layout. So many cute photos - great memories being made. Like your double page, title and cluster. I can't believe how big they are getting! And they are just adorable! I love the blues and the patterns you used. Hope February is warmer for you! I love all the blue. Such cute photos too. 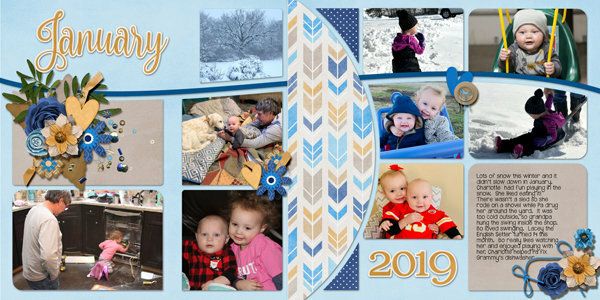 Thanks for showing off the Scrap It Monthly Templates!